← How to convert px3 to tiff via command line? People need to edit PDF creator when they convert HTM to PDF, because they want readers to know the PDF file is created by which application. This article will take the command line application of VeryPDF HTML Converter as an example to show you how to edit PDF creator and convert HTM to PDF via command line. 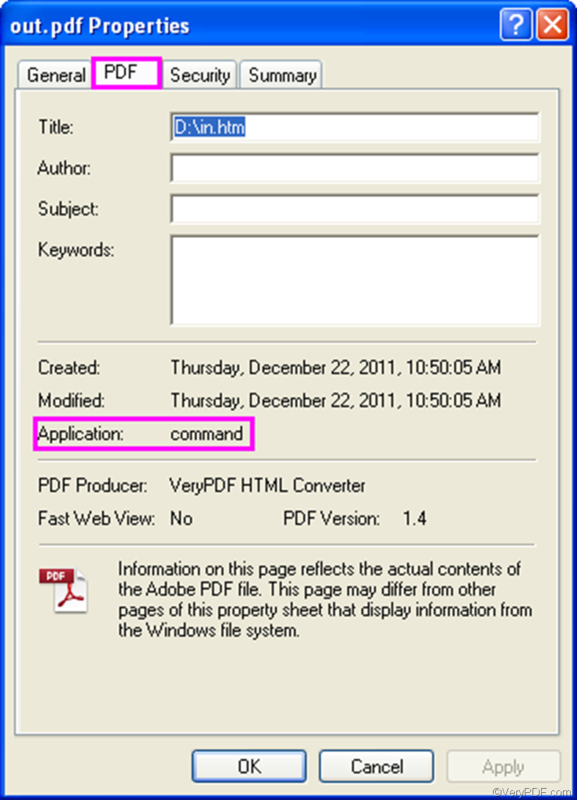 In fact, VeryPDF HTML Converter provides two versions: the command line version and GUI version. A GUI may be easier to use because of the mouse. However, using a mouse and keyboard to control your operating system takes much more time than working in a command line. Hence, if you want to save your time, why not try to use the command line version for this time? This command line application does not require any Adobe product installed in your computer. The following will show you how to take three steps to convert HTM to PDF and edit PDF creator. You can free download the command line application of VeryPDF HTML Converter by clicking VeryPDF HTML Converter Command Line. When the command prompt window appears on the computer screen, you can type a command line in the window. The command line syntax below may be helpful if you don’t know what should be included in a command line. The angle brackets are used to enclose essential contents. string refers to character string. D:\htmltools\htmltools.exe ----The directory of the command line application. It represents the command application stored in the folder called htmltools on disk D.
D:\in.htm ---- the directory of the input files. It represents the input file named in in the format HTM on disk D.
C:\out.pdf ---- specifies PDF as the output format, and indicates that the output file should be named out and placed on disk D.
Now do you know how to type a command line? After you type the command line, please press “Enter”. The computer will start working right away. You can also view the process information in the command prompt window as illustrated below. When you see “Result=OK”, that means the job is completed. How to convert mhtml to png? This entry was posted in HTML Converter (htmltools) and tagged command line, edit PDF creator, htm to pdf. Bookmark the permalink.